Each year, nearly 13,000 cases of cervical cancer are diagnosed in the U.S. This disease was once one of the leading causes of cancer death among women, but the death rate has dropped more than 50 percent over the last 30 years. Screening tests and vaccines have worked to help make cervical cancer one of the more preventable and curable cancers today. However, more than 4,000 women are expected to die from cervical cancer this year. 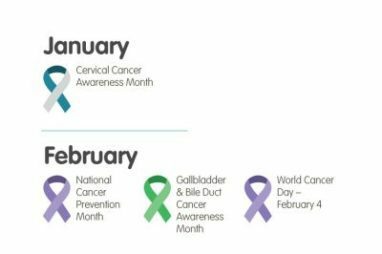 During Cervical Cancer Awareness Month this January, you can help make a difference by learning about the risk factors and symptoms, as well as spread awareness about screenings and preventative measures available. Although cervical cancer rarely develops in women younger than 20, prevention can start as early as age 11 with the HPV vaccine. The human papillomavirus (HPV) is a very common virus, affecting roughly 79 million people in the U.S. Many infections go away, but chronic HPV infections can lead to several different types of cancer including cervical cancer. Since being introduced in 2006, the vaccine has cut HPV infection rates in half among teen girls, which has also decreased precancerous symptoms and cervical cancer rates as well. The CDC recommends having boys vaccinated as well because HPV can lead to cancer in other organs as well. If you are interested in having your children vaccinated, girls and boys ages 11 to 12 can receive the shot in 3 separate doses. Teens and young adults through age 26 who haven’t received the shot can still ask their doctor about receiving it, although it is most effective when given before age 13. Smoking. Women who smoke are twice as likely to get cervical cancer compared to women who don’t. Tobacco substances absorbed into the bloodstream can cause damage to cells in the cervix and put you at higher risk for cervical cancer. HIV or AIDS. Having an immunosuppressant condition such as HIV or AIDS puts women at a higher risk for contracting HPV. Having a compromised immune system can also make it more difficult for your body to destroy precancerous cells before they grow and spread. Sexually transmitted infections. Women with STIs such as chlamydia have a higher risk of cervical cancer compared to women who don’t. Not eating enough fruits and vegetables and being overweight. A poor diet and higher body weight is associated with a higher risk for cervical cancer. Long-term use of oral contraceptives. Studies have shown that oral contraceptives increase the risk for cervical cancer, but the risk goes back down to normal once contraceptive use is stopped. Having a full-term pregnancy at age 17 or younger. Women who were younger than 17 for their first full-term pregnancy are twice as likely to get cervical cancer later in life compared to women who were 25 at their first pregnancy. Poverty. Women who lack access to healthcare services that include cervical cancer screening tests are less likely to have pre-cancers and cancers caught early on. Use of the DES hormonal drug. DES is no longer used, but women whose mothers took DES during pregnancy are more slightly more likely to develop cervical cancer. Cervical cancer is rare among children, but many other situations and health conditions can make life difficult for children. That’s where Wheels For Wishes comes in. When you donate a car to Wheels For Wishes, the proceeds from your donation will go to children’s charities in your area, which help to provide a better life for kids. Find more information about the charity that benefits in your area using our chapter locator. If you have an unneeded vehicle and you’re ready to help give children a better life, donate your car today! Donations can be made using our online car donation form or by calling 1-877-431-9474. Every donation makes a difference!